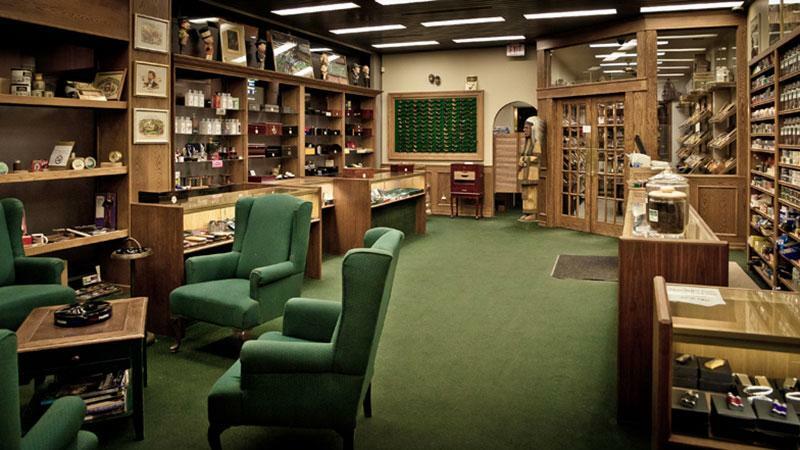 Located a stone's throw from Winnipeg's most popular venues such as The MTS Centre and the RBC Convention Centre, Thomas Hinds Tobacconist has been a destination for both locals and tourists to procure cigars, accessories, and a host of other masculine products such as wet shaving wares and pipes. A muddled collage of celebrity pictures blanket the walls as you walk into the quintessential tobacco shop that likely hasn't updated its decor since they opened in the early-90s. But in a province where smoking has increasingly been outlawed, the shop remains one of just a handful of indoor, smoke-friendly establishments in Manitoba that have been grandfathered into new and despotic legislation imposed by the Manitoba and Winnipeg health departments. After arriving, the manager, Dave Morrison, leads me into the capacious walk-in humidor where he shows me a finely appointed selection of well-aged Cuban cigars, Dominicans, Nicaraguans and various other curated collections from around the world. A non-smoker, Morrison still knows his brands. He parades me around the annular aisle of the floor-to-ceiling humidor as he points out the intricacies and flavor profiles of the many cigars we stop to examine. I select a relatively firm Davidoff Nicaragua Robusto. We slowly move from the humidor to the lounge area that serves as a haven for their regular customers and those from out of town who don't want to smoke outside in Manitoba winters, known to be some of the coldest in the world. As the only legal indoor lounge in town, Thomas Hinds has re-written all the rules cigar smokers would normally balk at. It only allows a maximum of three people to smoke at a time, and the shop keeps strict hours that only last from 3:30 p.m. to 5 p.m., plus it requires a reservation and only permits walk-ins on a case-by-case basis. They do this because they are, first and foremost, a cigar shop, and the lounge is just an extra incentive offered to their customers. Sitting in a vintage green easy chair, the comforts of the pillowy cushion begin to swallow me, which makes me dread the idea that I could potentially be asked to get up and leave once the clock strikes their strict five o'clock closing time. The quiet sitting room sees only a handful of smokers enjoying the convenience each day. It's certainly not a Winnipeg hotspot like the cigar-friendly rooftop patios of The Met or Tavern United in the summer, but it is an ideal escape for those who prize the solace of library-style lounges over the social advantages of the sports bars and nightclubs so prevalent today. Thomas Hinds may not be the best lounge you'll ever visit, but their selection of Cuban cigars is unparalleled, which is why they've become the most revered tobacconist in the heart of the continent. Open Monday through Friday: 9 a.m. to 6 p.m.